Published on June 4, 2010 by Wade Shepard Follow me on Twitter here. FINCA TATIN, jungle, Guatemala- It is perhaps a misconception that a backpacker needs a backpack to travel. In reality, any adequate size, sturdy bag will do. Before going traveling it seems as if most young travelers jump for a hiking backpack as a rule, the traveler roads of the planet are chock full of this single type of luggage. Though 90% of these travelers do not seem to really need a backpack, as pretty much any type of baggage would work just as well, if not better. The backpack seems to be more of a vouch towards style than a piece of equipment that is actually needed for travel. An unflattering and grubby tote bag, such as the type that sits idle in the basements, attics, and closets of the world. A quick survey of your parent’s home will often produce more old tote bags than a lifetime of travel could ever necessitate. Paulo from Pablo Is Here travels with a single, medium size tote bag. That is all he needs. He did not seem to have chosen this type of baggage by accident. He told me that a tote bag makes him less of a target for thieves or other malicious intents. I had to agree with him. A guy walking down the street with a tote bag does not necessarily indicate a person carrying any semblance of wealth, but a traveler with a full rucksack is an indication that the person has all of their wealth on them. It is normal for a person who lives in a place to carry a few things around town in a tote bag, it is not normal in the least to go for a stroll with a full size hiking bag on your back. A tote bag makes a traveler far more inconspicuous. Backpacks are bulky, somewhat awkward, completely conspicuous. A tote bag is small, can easily be manipulated with your hands through crowds, buses, or other tight places, and it is easier to watch over. By nature, a backpack is placed on your back in a place that you cannot see. It is fairly easy for someone to remove items or slice through a backpack — it is far more difficult to safeguard that which you cannot see or reach. It is my impression that it is much more difficult for a theif to get into a bag that you are able to carry in front of the body and hold with not only a strap around the body but with both hands as welll. I have traveled with all types of different bags, I know that I feel the most comfortable when I can easily move my luggage up in front of my body at a moment’s impulse. I now travel with a messenger bag — which is more or less a skinny tote bag — on the front of my body and a backpack behind. 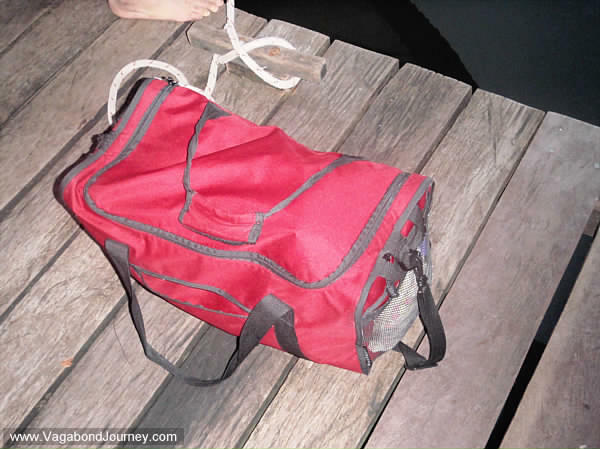 I keep nothing that I would seriously mind loosing in the backpack — I don’t want to worry too much about what is going on back there, if a thief wants my dirty socks and a cooking pan, then that is their issue. If you are going to be walking long distances with all of your gear, hiking up mountains, camping, refuse to take taxis, and will generally spend a good amount of time carrying all of your travel gear, then a backpack could be essential. The backpack is a great piece of luggage, it has the unique ability that it can distribute the weight of your load between your shoulders, hips, and legs while leaving your hands free — backpacks are good for travelers who carry full loads for long distances. But most travelers don’t carry thier bags for very long. I can attest to this from working at hostels. I know that, in fact, most travelers treat walking with their bags as a massive chore to be avoided at all costs. They take taxis, buses, trains, and planes, they rarely walk far to their hotels or hostels, they rarely ever have their backpacks on their backs. For this type of travel, a backpack is perhaps overkill — it is unneeded. A tote bag would do just as well. I have never done backpacking, so this may not fit, but I always use a basic duffel bag for travel. Small, big, whatever is needed. I generally bring a second, thin, duffel bag to use for my jacket, or whatever. If traveling on a bike that does not have enough saddlebag room, I strap a top loading side bag on the rear seat, then just stuff a duffel bag in it, and use that to bring my stuff into my room. I have never had use for a backpack for the kind of travel I do, only for hiking. Backpacks are for hiking, you hit the nail on the head here, Bob. If you are not hiking in your travel, any bag will do. Duffel bags and tote bags are good, as they are rectangular and are shaped for optimal packing space. 30l is the way to go. Perfect size for travel in a world where airlines control what possessions you can travel with. I totally agree with the post that for some types of travel, a large rucksack is bit of an overkill. If you’re going to be staying at hotels, then why make yourself conspicuous by carrying around a large rucksack? In fact, I would say hardy wheeled luggage is a good choice if you’re not planning on big time hiking or trekking. I saw this amazing collection of outdoor luggage from Briggs & Riley. They have some really rugged looking and practical adventure luggage.